Calentita! Street Food or Gourmet Nosh? The Spring Festival came to its climactic ending with Calentita! Gibraltar’s annual food festival. 40 stalls served food to over 6000 people throughout the evening spread between Grand Casemates Square and Market Place. The live kitchen with professional chefs was televised on big screens so that the crowd could see the food being prepared. The Big Table which proved popular last year was expanded to allow a larger volume of eating traffic. Two of the food stalls that have been around since the inception of Calentita! 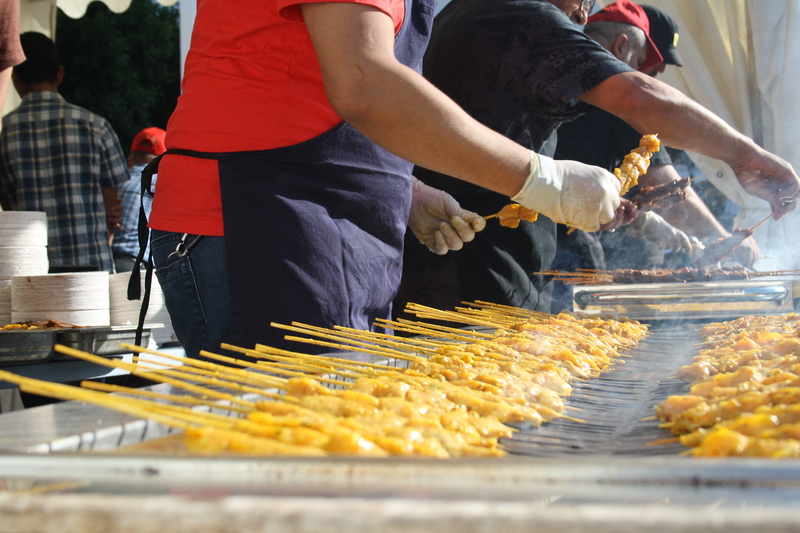 9 years ago continue to be the most popular with the crowds; the Moroccan and Indian food stalls. The crowds were gathered around the Moroccan stall by 6:30pm awaiting the 7pm bell; salivating like Pavlovian dogs. This stall always does well with hundreds of beef and chicken pinchitos cooking at any one time. (Actually, I’ve never been able to tell whether they sell anything else?) I remember that last year people came directly off the beach in their swimwear and queued up for these delicious pinchitos! When the bell rang at 7pm the stall I was nearest to was the Indian food stall. I managed to beat the queues and went straight to the front whereupon I was served immediately. There were several options to choose from. For £5 I ordered a Cobra Beer and a chicken biryani. The biryani was delicious and heavily scented with cardamom, cinnamon and clove; the chicken fall-off-the-bone tender. I’m sure it was unintentional; the pots the biryani was served in fit snugly in the pint glass which meant I could walk around eating and drinking without the need to ask someone to hold my glass. This meant I could continue walking around, soaking up the atmosphere whilst enjoying the food. Vital at a food festival. My last foodie experience of the evening came by the Gastronomic Tapas Tasting at El Capote. 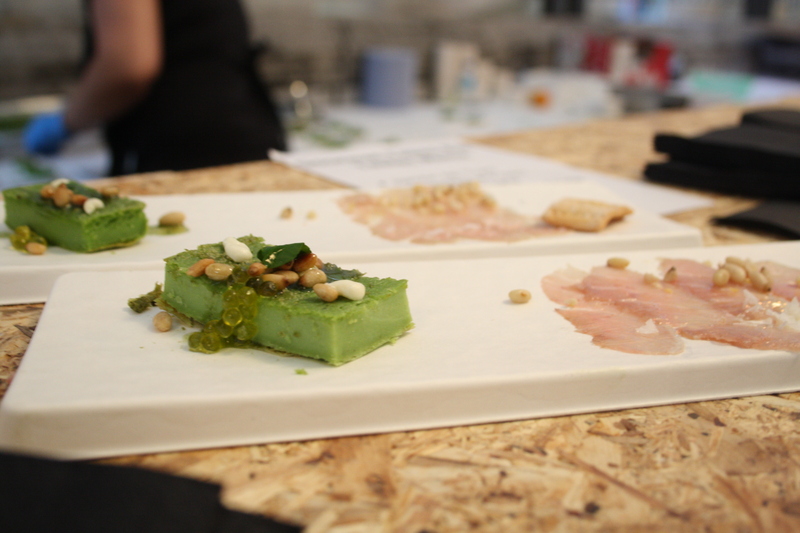 £20 got you 5 tapas cooked in El Capote’s deconstructed/molecular gastronomy manner. The dishes were: Snack, Sangria, Atún and BBQ. For those of you who have either experienced these evenings at El Capote for yourself or have read my blogs/reviews previously you’ll know about this approach. For those uninitiated, it is basically taking a dish, separating each of its constituent parts and presenting it in a way using new techniques. 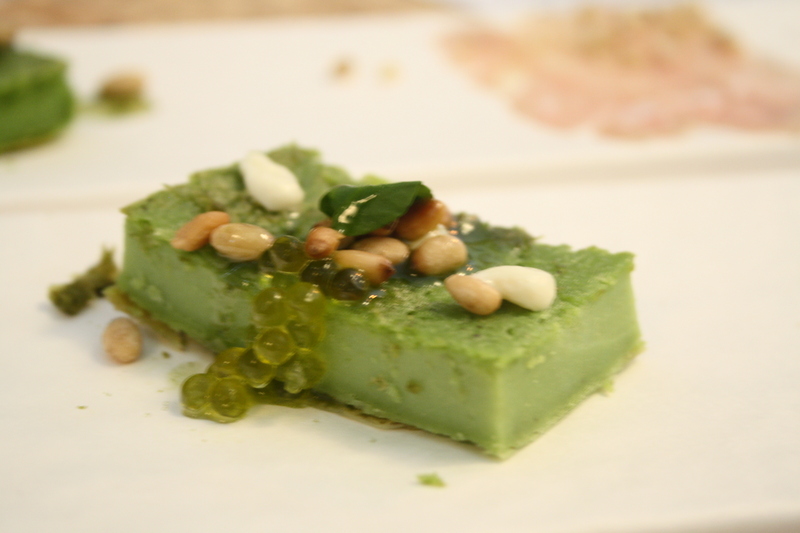 SNACK – a dish of two parts, the first a pesto calentita served with toasted pinenuts and olive oil beads which was very nice however, not a true calentita in the purest sense of the word, the second jamón de toro. This ‘jamón’ was thinly sliced fatty tuna (ventresca) brushed with fat (good fat). The fat tasted like Spanish jamón de pata negra so therefore acorn rendered fat. And just like high end Spanish hams, the fat coated the inside of the mouth and made you question whether this was really cured ham or tuna. Delicious. SANGRIA – as Chef Lede called it, “Sangria Solida”. A few cubes of sangria were served on ice and topped with zest of lime. How was the sangria solidified and kept from melting I hear you ask? Chef Lede infused watermelon cubes with homemade sangria. The cubes were easy to bite into – they had the texture of watermelon and the sangria taste was clearly present – with a dash of spirits here and there and brought to life with the lime zest – dangerously refreshing! 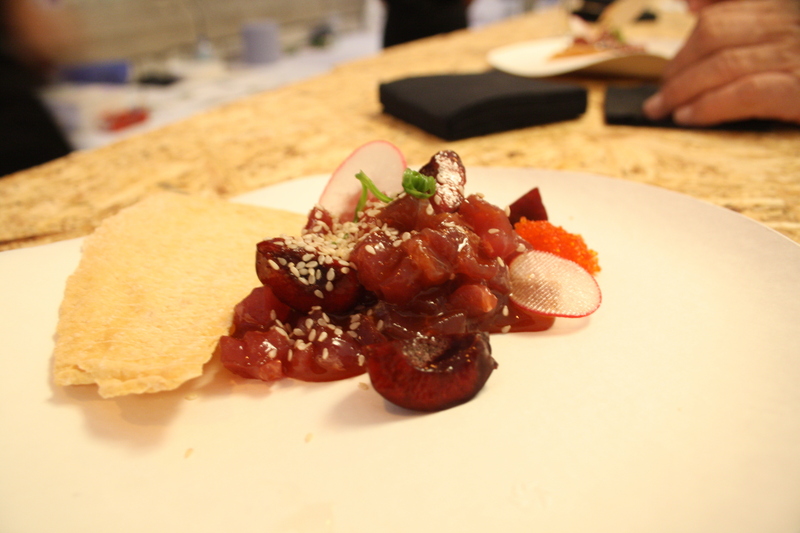 ATÚN – diced tuna marinated in kimchi (a spicy Korean dressing with citrus notes) and served with red cherries and salmon roe. This was my favourite of the five tapas – tuna from Barbate, Spain is of such a high quality that raw is how to best enjoy the product. The kimchi dressing both spicy and sour a perfect counterpoint to the sweet, fruity cherry and salty roe. Beautiful! My greedy side wanted a bucket load of this dish, however, with rich tuna – less can sometimes be more. 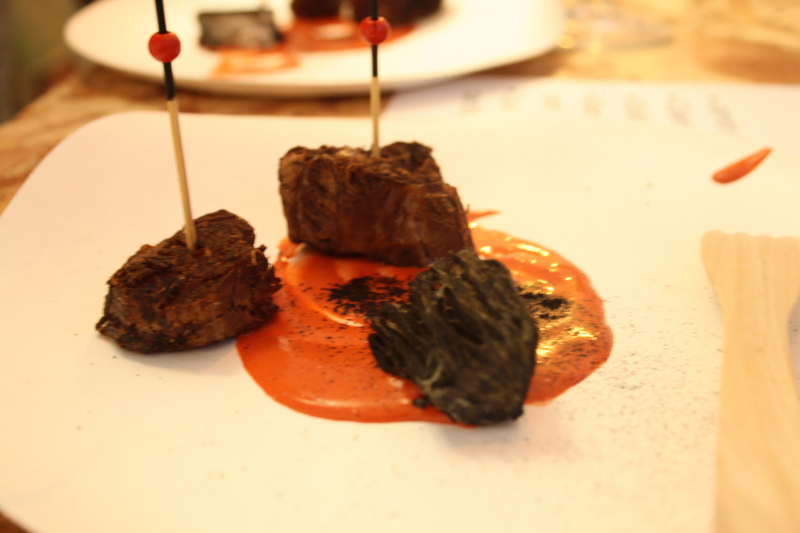 BBQ – the most inventive of all the tapas and visually mindblowing! Imagine 3 items on a plate sitting on tomato sauce. Two are slow cooked cuts of meat, the other a piece of charcoal. Yes, charcoal. Then you are told that the charcoal is edible. You poke and prod it with your fork and it really does have the look of charcoal – however when you cut into it, it has the texture of a scorched-roasted chestnut. Its taste was much like a yam, or white sweet potato. This was in fact yuca – not to be confused with the plant yucca! I have since been informed that the milk white flesh was dyed black with food colouring to give it its distinctive charcoal look. So from street food to gourmet tapas, I left Calentita! a very happy man. 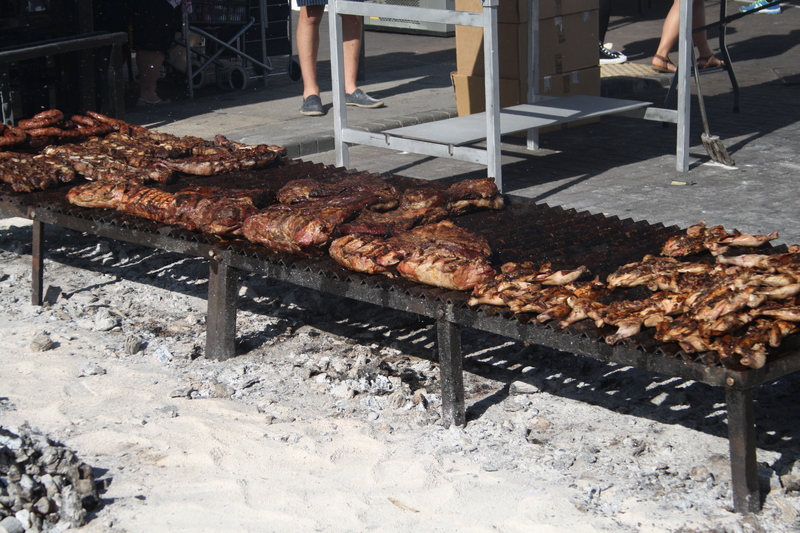 But it did make me wonder what Gibraltarians want to get out of this food festival. Do we want new food experiences; new flavours that we haven’t been able to try in Gibraltar previously or are we just looking to fill our belly? Judging by the queue surrounding the popular stalls, it is clear that people are going for food that is familiar to them. Does this a food festival actually make?